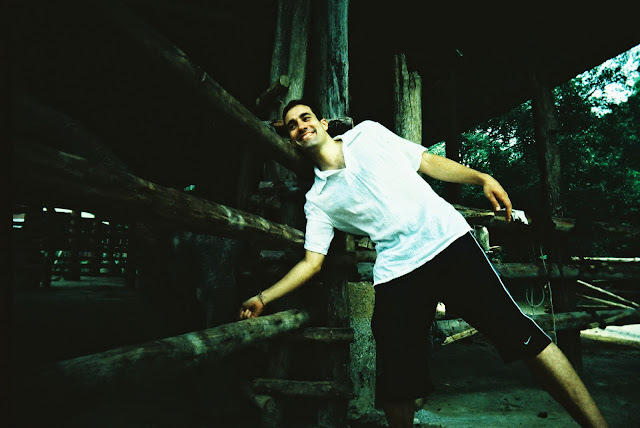 The Valencian has an elephant memory. It was often surprising, and sometimes humiliating.When I least expected it, for instance, while walking on the streets of the Saturday Walking Market in Chiangmai, shopping for unique handmade things, he turned to me in response to my comment that I'm a really impatient person - that, I admit I am - and said that what I said was really astonishing, given the fact that I was late for 20 minutes upon our first meeting. It rendered me speechless to hear such words, not spoken in the manner of someone holding a grudge, but without spite. Spoken out of innocence by a man with a good memory. A mere twenty minutes, pffft. Was that his first impression of me? I wanted to write about how this trip was meaningful, and significant to me. Meaningful because, I went there to catch a friend I've met in Singapore 2 months prior, and he became a friend for life after that weekend. And also, it would be my last trip for some months after a variety of spontaneous trips. My 7th trip in the last two months; some people actually think I travel for a living. Significant because, for possibly the first in a long time, I've actually done what normal people do, actually plan in advance, scan the sky for the best direct flights, and book the tickets in advance, si, two months in advance. I think I actually saved two hundred dollars! But I am at a loss of words to describe the people I've met in Chiangmai. The old lady sheltering from the rain, looking like a frail Thai Chinese, she actually bicycles through the old town for exercise. We chatted like old friends for twenty minutes, and upon her suggestion she directed me to a flower market outside of town where I spent a lovely drizzly afternoon, my last afternoon in Chiangmai, surrounded by the scent of flowers. If I had behaved like a normal tourist and just rushed from place to place, I would have never had found the flower market on my own. The local beauty salon ladies who gave me a shampoo and blowdry, they couldn't stop cooing over the fairness of my long legs throughout and even touched parts of leg... It was unnerving to hear them all say they preferred my skin color. I thought they looked awesome in their bronzy glow and told them so. The Chinese student who went on a secret trip on her own - people still gasp when I tell them I travel alone, but I wouldn't have been so daring when I was at her age. The feisty Costa Rican who is living her life on her own terms and whom I immediately liked. I hope she finds that her dreams come true soon. The one that is written on the palm of her hand. 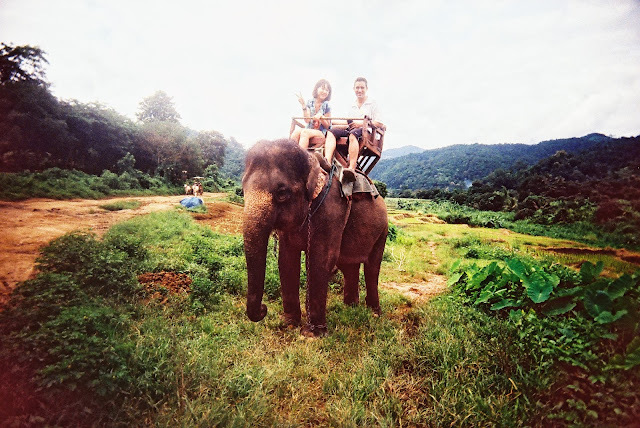 The young Dutch, the gentle-macho type who immediately took a liking to me - and his mother, too, who regaled me with stories about their first summer vacation to South East Asia. I took a good shot of them, one I really liked. And the lovely Bangkokian who relocated to be close to her parents who relocated to Chiangmai. She owns a kistch crepe stand and behind it, a very professional photo studio. She was very kind, very pretty, and the crepe was a fantastic, simple breakfast. And the elephants, the elephants. Those majestic creatures who looked liked they could talk for hours if they could speak. The Valencian was enthralled too, more so than me. Quick! Take photos of me with the baby elephant, he commanded. 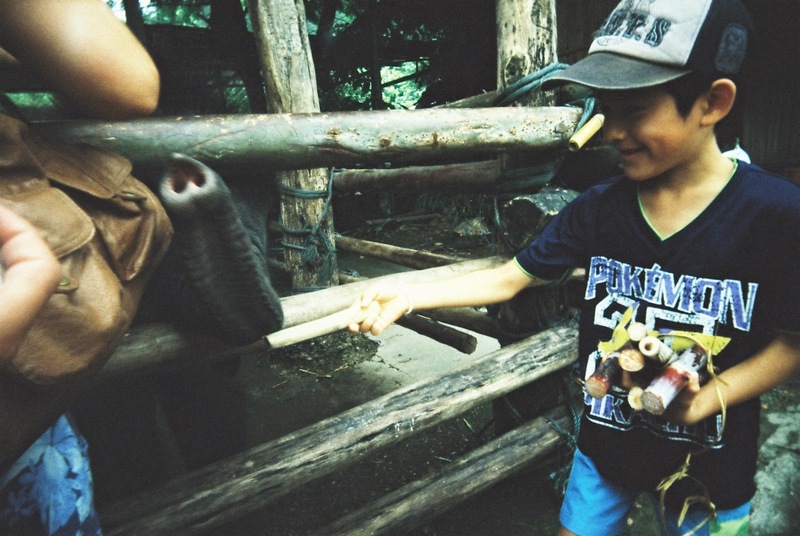 During the elephant show, he whispered to me like a small boy asking his mother for permission: I'm going to play with the baby elephant, vale? 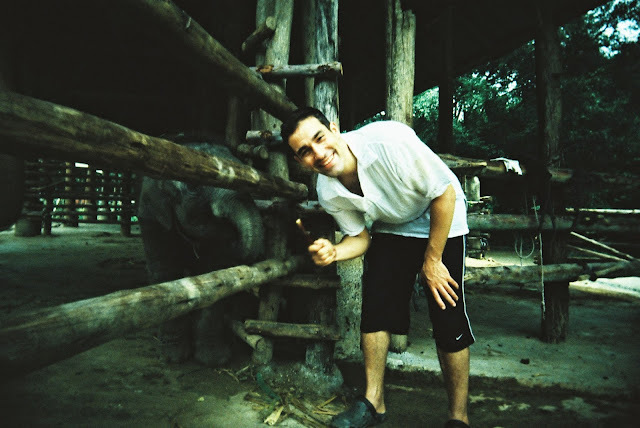 This baby elephant behaved like a small dog, almost bounding over the wooden posts, and playfully nudging my tiny foot with its massive one... it had prickly hair and its skin felt like... well, it felt like the way it looked. During the elephant ride, the Valencian was overly concerned for our elephant. It was a tad littler than the others and we were overtaken several times. 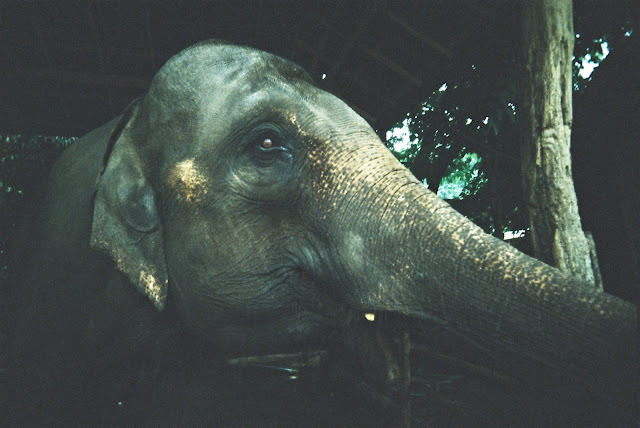 At certain junctures on the arduous walk through the jungle we felt certain that our elephant could not make it. 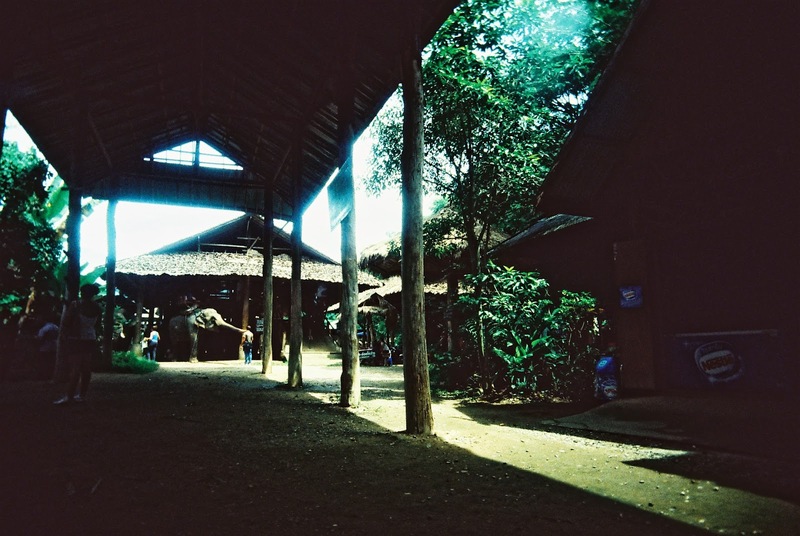 Only when we saw the clearing, both he and the elephant became happier and our elephant even playfully blew some water from its trunk on my shoe. 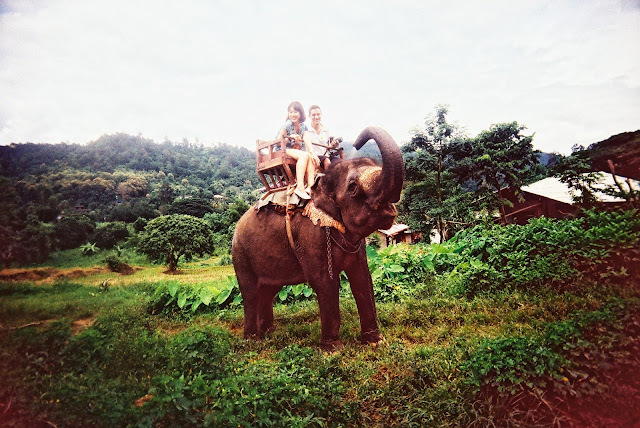 But the Valencian's heart sank again when he realized that our elephant had to make the same journey back, ferrying another round of tourists. At least we aren't heavy, I consoled him. Perhaps we were chosen for this elephant because of our lithe frames. To catch the glimpse of joy on the Valencian's face as he fed 'his' baby elephant with bananas and sugarcane was a bit like being in heaven where the scene before you was just a little too perfect and joyful to mirror our sorrowful, worrisome lives. 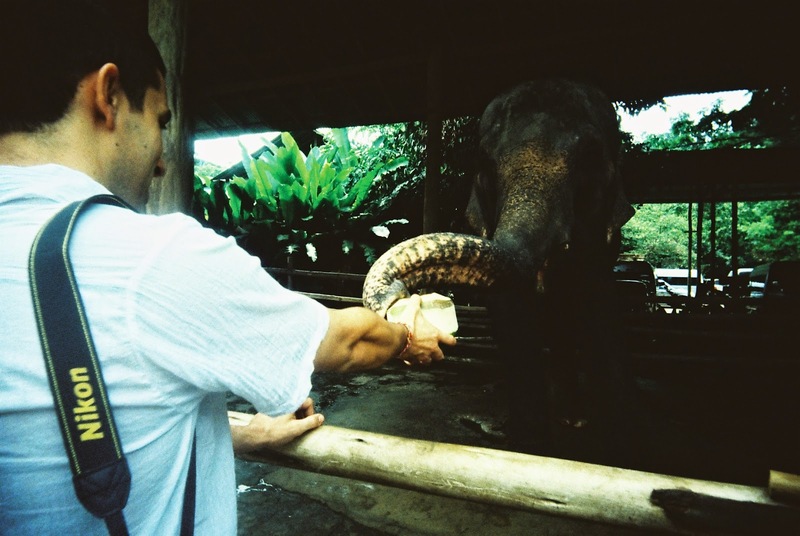 He imagined 'saving' his baby elephant, and bringing it back to his house in Valencia, we were told it cost 1 million baht or close to S$40K, and as an adult it would probably consume 100 litres of water a day and countless kilograms of fresh food. Perhaps it could be a mascot for his football team (Valencia FC), and we could make money by offering special appearances... we let our thoughts run wild for a second. Even though at the very end, I was sentimental because I would probably not see the Valencian again, not ever, or at least, not for a very long time, I printed out the photo of us on the elephant. And I carried it around with me for a week after I came home. 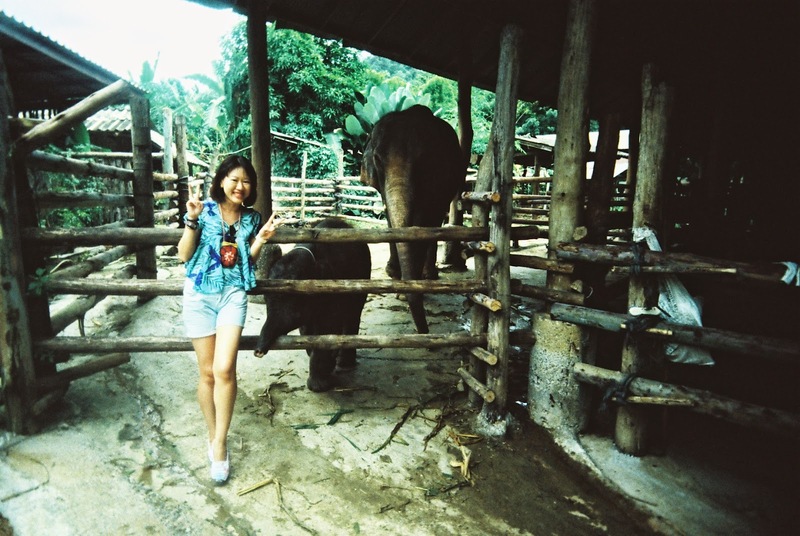 We were all happy in the photo, the Singaporean, the Valencian, and our elephant!!! 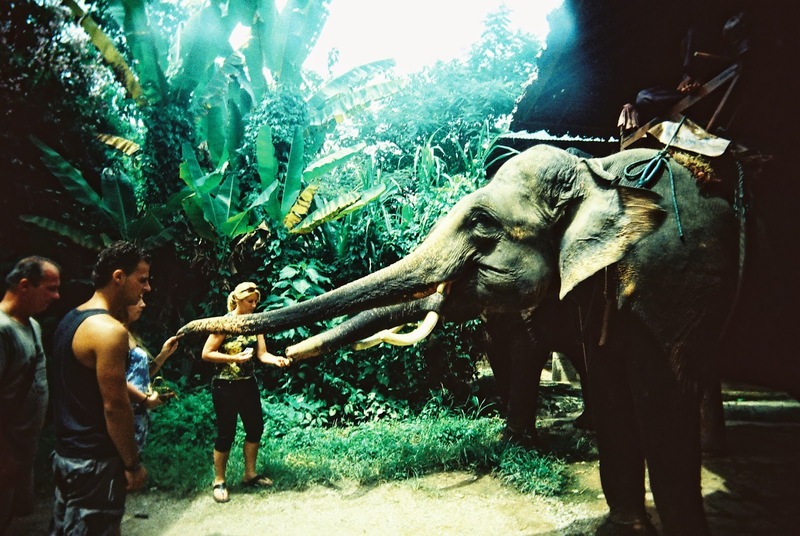 All photos on Lomography Chrome Xpro 35mm film taken on Vivitar Ultra wide & Slim (Superheadz).